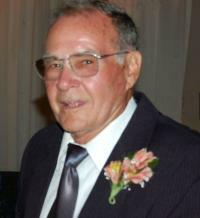 Mr. Harold D. Rockman, age 87, died peacefully November 11, 2018 at Hospice House of Shiawassee. He is survived by his children Harold Jr. (Ann) Rockman, Laura (Tom) Temple, Michael Rockman, Pat (Debbie) Rockman, Christine (Ricky) Richardson, and Judy Rockman; 18 grandchildren; 21 great grandchildren; siblings, Glenda (Russell) Smith and Roy Rockman; and many nieces, nephews, and friends. Visitation will be Thursday from 4pm until the time of his funeral service at 7pm, at the Temrowski Family Funeral Home, 500 Main Street, Fenton. Burial will be Friday, 11am, at Great Lakes National Cemetery in Holly. In lieu of flowers donations may be made to the Hospice House of Shiawassee.